Seither wird regelmäßig aktualisiert, wie sich die Schuldensituation entwickelt. Dabei machen die Kollegen nichts anderes, als die öffentlich verfügbaren Daten optisch ansprechender zusammenzufassen, was allerdings zu dem gewünschten Effekt der medialen Präsenz führt. Kaum ein Artikel zum Thema, der nicht die McKinsey-Darstellungen nutzt. Zurecht. „As the Great Recession receded, many expected to see a wave of deleveraging. But it never came. 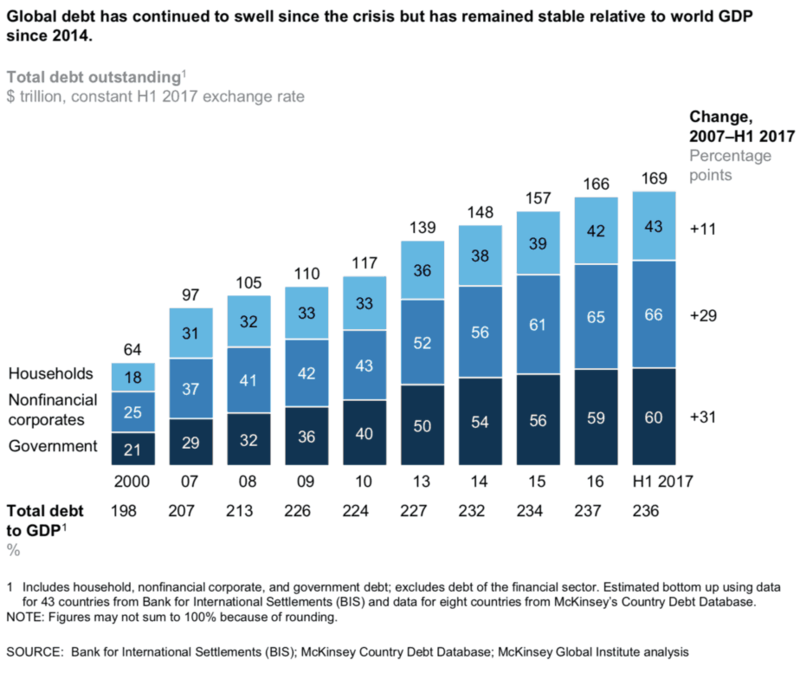 Confounding expectations, the combined global debt of governments, nonfinancial corporations, and households has grown by $72 trillion since the end of 2007 (Exhibit 1). The increase is smaller but still pronounced when measured relative to GDP.“ – bto: Das wissen wir alles, aber die Abbildung ist schön. „Governments in advanced economies have borrowed heavily, as have nonfinancial companies around the world. 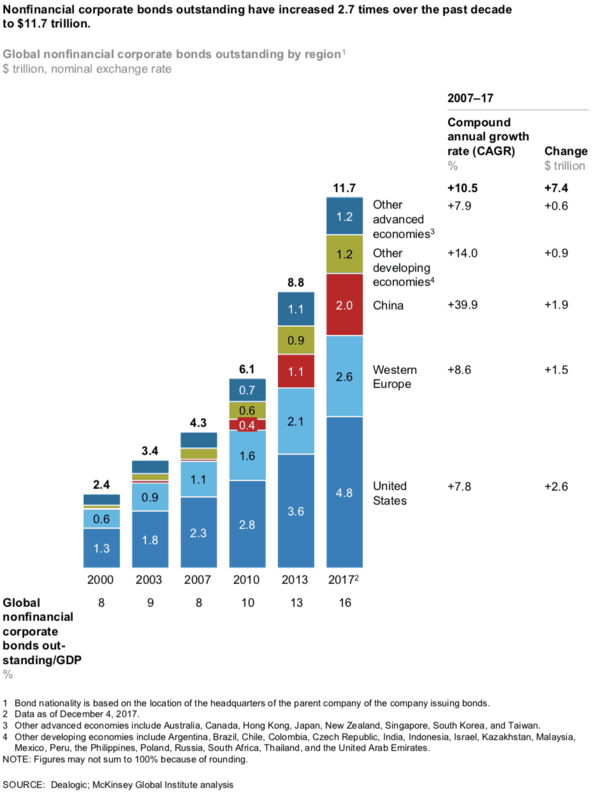 China alone accounts for more than one-third of global debt growth since the crisis. Its total debt has increased by more than five times over the past decade to reach $29.6 trillion by mid-2017. Its debt has gone from 145 percent of GDP in 2007, in line with other developing countries, to 256 percent in 2017. This puts China’s debt on a par with that of advanced economies.“ – bto: mit den hier kürzlich (erneut) diskutierten Risiken. „Consistent with history, a debt crisis that began in the private sector shifted to governments in the aftermath. From 2008 to mid-2017, global government debt more than doubled, reaching $60 trillion. Among Organisation for Economic Co-operation and Development countries, government debt now exceeds annual GDP in Japan, Greece, Italy, Portugal, Belgium, France, Spain, and the United Kingdom. Rumblings of potential sovereign defaults and anti-EU political movements have periodically strained the eurozone. High levels of government debt have set the stage for pitched battles over spending priorities well into the future.“ – bto: womit wir eine globale Großkoalition von Inflationisten und Bankrotteuren haben, weshalb es selten dämlich ist, dass wir hier so viel sparen. „In emerging economies, growing sovereign debt reflects the sheer scale of the investment needed to industrialize and urbanize, (…) Countries including Argentina, Ghana, Indonesia, Pakistan, Turkey, and Ukraine have recently come under pressure as the combination of large debts in foreign currencies and weakening local currencies becomes harder to sustain.“ – bto: auch hier besprochen. Sich in einer fremden Währung zu verschulden, ist immer hochgefährlich. „The International Monetary Fund assesses that about 40 percent of low-income countries in sub-Saharan Africa are already in debt distress or at high risk of slipping into it.“ – bto: Allerdings spielen die für Weltwirtschaft und -finanzsystem keine große Rolle. „Global nonfinancial corporate debt, including bonds and loans, has more than doubled over the past decade to hit $66 trillion in mid-2017. This nearly matches the increase in government debt over the same period. (…) This poses a potential risk, particularly when that debt is in foreign currencies. Turkey’s corporate debt has doubled in the past ten years, with many loans denominated in US dollars. Chile and Vietnam have also seen large increases in corporate borrowing.“ – bto: Und damit ist es ein Problem- und Krisenherd. Egal, was man nun dazu sagen möchte, es ist ein Thema, sobald Zinsen steigen oder die Wirtschaft sich abschwächt. „China has been the biggest driver of this growth. From 2007 to 2017, Chinese companies added $15 trillion in debt. At 163 percent of GDP, China now has one of the highest corporate-debt ratios in the world. We have estimated that roughly a third of China’s corporate debt is related to the booming construction and real-estate sectors.“ – bto: Klartext – unproduktiv und vermutlich zu einem guten Teil faul. „Having slogged through a painful period of repayment, foreclosures, and tighter standards for new lending, US households have reduced their debt by 19 percentage points of GDP over the past decade (Exhibit 4). But the homeownership rate has dropped from its 2007 high of 68 percent to 64 percent in 2018 — and while mortgage debt has remained relatively flat, student debt and auto loans are up sharply.“ – bto: vier Prozentpunkte in zehn Jahren!!! Das war es? Klarer kann man nicht machen, dass es eben nicht möglich ist, zu deleveragen. Erklärt übrigens auch Donald Trump als POTUS. „Household debt is similarly down in the European countries at the core of the crisis. Irish households saw the most dramatic growth in debt but also the most dramatic decline as a share of GDP. 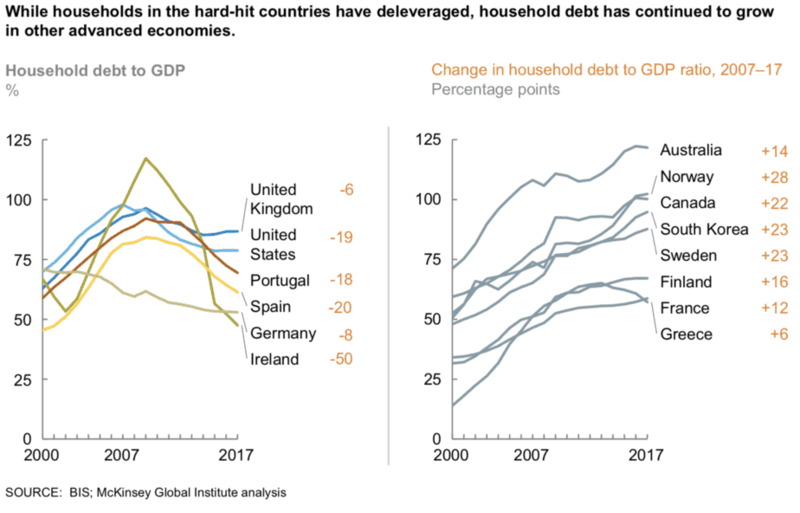 (…) Spain’s household debt has been lowered by 21 percentage points of GDP from its peak in 2009—a drop achieved through repayments and sharp cuts in new lending. In the United Kingdom, household debt has drifted downward by just nine percentage points of GDP over the same period.“ – bto: Ja, es gab einen Abbau. Die Staatsschulden stiegen derweil in diesen Ländern deutlich. „In countries such as Australia, Canada, South Korea, and Switzerland, household debt is now substantially higher than it was prior to the crisis. (…) Today, household debt as a share of GDP is higher in Canada than it was in the United States in 2007.“ – bto: was wiederum vor allem mit Immobilien zu tun hat. Klare Folge unserer Geldordnung. Danach erklärt McKinsey, weshalb das Bankensystem heute gesünder ist. Der Teil der Analyse, den ich gerne glauben will, wo ich mir aber nicht so sicher bin. Ich denke, wir haben noch mehr Probleme – gerade in Europa –, als wir wahrhaben wollen. „The Tier 1 capital ratio has risen from less than 4 percent on average for US and European banks in 2007 to more than 15 percent in 2017. The largest systemically important financial institutions must hold an additional capital buffer, and all banks now hold a minimum amount of liquid assets.“ – bto: Diese Definition ist für Außenstehende schwer erklärlich. Wenn wir an die Non-Performing Loans in Italien und die zweifelhafte Qualität der Stresstest in Europa denken, so ist das nicht beruhigend. „In the past decade, most of the largest global banks have reduced the scale and scope of their trading activities (including proprietary trading for their own accounts), thereby lessening exposure to risk.“ – bto: Aber dafür haben wir weniger liquide Märkte, was die Stabilität eher gefährdet als sichert. „But many banks based in advanced economies have not found profitable new business models in an era of ultra-low interest rates and new regulatory regimes. Return on equity (ROE) for banks in advanced economies has fallen by more than half since the crisis. The pressure has been greatest for European banks. Their average ROE over the past five years stood at 4.4 percent, compared with 7.9 percent for US banks.“ – bto: was zum einen an der Geldpolitik liegt, zum anderen an der ungelösten Schuldenproblematik in der Eurozone. 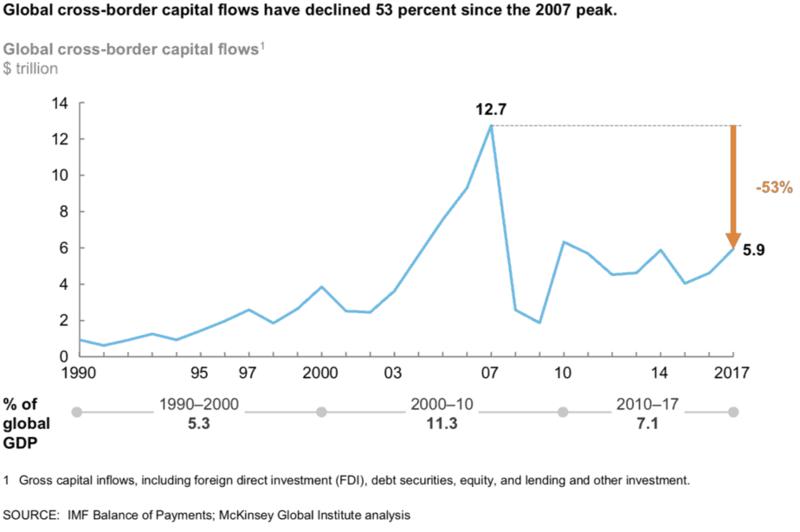 „One of the biggest changes in the financial landscape is sharply curtailed international activity. Simply put, with less money flowing across borders, the risk of a 2008-style crisis ricocheting around the world has been reduced. Since 2007, gross cross-border capital flows have fallen by half in absolute terms.“ – bto: was übrigens auch die Target2-Problematik erklärt! „Eurozone banks have led this retreat from international activity, becoming more local and less global. Their total foreign loans and other claims have dropped by $6.1 trillion, or 38 percent, since 2007 . Nearly half of the decline reflects reduced intra-eurozone borrowing (and especially interbank lending). Two-thirds of the assets of German banks, for instance, were outside of Germany in 2007, but that is now down to one-third.“ – bto: Wie ich sagte, spiegelbildlich wuchsen die Target2-Forderungen der Bundesbank. „The growth of corporate debt in developing countries poses a risk, particularly as interest rates rise and when that debt is denominated in foreign currencies. (…) There has been notable growth in noninvestment-grade “junk” bonds. Even investment-grade quality has deteriorated. Of corporate bonds outstanding in the United States, 40 percent have BBB ratings, one notch above junk status. We calculate that one-quarter of corporate issuers in emerging markets are at risk of default today — and that share could rise to 40 percent if interest rates rise by 200 basis points.“ – bto: Und das trifft immer sofort beides: die Finanzwelt und die Realwirtschaft. „Another development worth watching carefully is the strong growth of collateralized loan obligations. A cousin of the collateralized debt obligations that were common prior to the crisis, these vehicles use loans to companies with low credit ratings as collateral.“ – bto: so ist es, siehe letzte Woche bei bto. „Since the crisis, real-estate prices have soared to new heights in sought-after property markets, from San Francisco to Shanghai to Sydney. Unlike in 2007, however, these run-ups tend to be localized, and crashes are less likely to cause global collateral damage. But sky-high urban housing prices are contributing to other issues, including shortages of affordable housing options, strains on household budgets, reduced mobility, and growing inequality of wealth.“ – bto: Ja, denke dennoch, dass Krisen in Kanada und Australien und dem einen oder anderen lokalen Markt ausstrahlen. „While China is currently managing its debt burden, there are three areas to watch. First, roughly half of the debt of households, nonfinancial corporations, and government is associated, either directly or indirectly, with real estate. Second, local government financing vehicles have borrowed heavily to fund low-return infrastructure and social-housing projects. In 2016, 42 percent of bonds issued by local governments were to pay old debts. This year, one of these local vehicles missed a loan payment, signaling that the central government might not bail out profligate local governments. Third, around a quarter of outstanding debt in China is provided by an opaque ‚shadow‘ banking system.“ – bto: gute Zusammenfassung. „The world is full of other unknowns. High-speed trading by algorithms can cause “flash crashes.”(…) Cryptocurrencies are growing in popularity, reaching bubble-like conditions in the case of Bitcoin, and their implications for monetary policy and financial stability is unclear. And looming over everything are heightened geopolitical tensions, with potential flash points now spanning the globe and nationalist movements questioning institutions, long-standing relationships, and the concept of free trade.“ – bto: Auch hier kann man nur zustimmen. Fazit: Zehn Jahre später sind wir bei nüchterner Betrachtung nicht weiter. Und das Thema ungelöste Krise der Eurozone klammert McKinsey auch aus. Klar, denn dafür haben auch die Kollegen keine machbare und schmerzfreie Lösung. …ich habe mich immer gefragt, aber dies natürlich hier nie thematisiert. Zu Transferleistungen, um den Euro zu erhalten, meint er: „Wenn wir das auf die europäische Ebene übertragen, dann müsste Deutschland jährlich vielleicht 200 Milliarden Euro an Transferleistungen aufbringen. Unter dieser Voraussetzung könnte der Euro noch sehr lange Bestand haben.“ –> 200 Milliarden… Jährlich… Vielleicht… Vielleicht auch mehr… Also,wenn es weiter nichts ist! Daran wird es unter Merkel und ihrer linksgrünen Entourage bestimmt nicht scheitern. Den Sozialismus in seinem Lauf, hält weder Ochs noch Esel auf. „Die Debatte über die Target-2-Salden sei hingegen akademischer Natur. Sollte der Euro tatsächlich auseinanderbrechen, könne die Bundesbank offene Positionen intern ausgleichen. Borghi: „Ich möchte auch dem Missverständnis vorbeugen, dass es sich bei den Target-2-Salden um offene Forderungen Deutschlands an Italien handelt. In Wirklichkeit sind es Forderungen der Bundesbank gegenüber der EZB.“ –> Also Forderungen sind es seiner Ansicht nach schon, aber jedenfalls nicht gegen IT, sondern gegen die EZB. D hat damit zum großen Teil gegen sich selbst. Interessant! 200 000 000 000 Eur pro Jahr wären dann ca. 200 Eur pro Kopf und Monat in Deutschland. Natürlich sollte man so etwas dann nur per Lohnsteuer einbehalten und nur sozialversicherungspflichtig Beschäftigte heranziehen. Dann wäre es gut 500 Eur pro Beschäftigten. ???? Und was hat das Thema TARGET mit Lohnsteuer und SV zu tun??? Entweder stehe ich auf dem Schlauch oder aber Sie schreiben wirres Zeug. Vielleicht starten Sie ja noch einmal einen Erklärungsversuch, was Sie uns hier mitteilen möchten. Ja, (fast) alles schlimmer als vor 10 Jahren. Warum? Das Wesen des Kapitalismus ist es, aus Geld mehr Geld zu machen. Das funktioniert über die Realwirtschaft nur so lange, wie auch die Einkommen genügend steigen. Steigen die Einkommen nicht mehr genügend, dann kann das Spiel einige Zeit über zusätzliche private Verschuldung laufen. Dafür ist der Absturz anschließend umso heftiger, da nicht nur der Kreditimpuls fehlt, sondern zugleich die Zinslasten die Kaufkraft belasten. Dieses fundamentale Problem hatte ich vor 5 Jahren mit der Geschäftsführerin der TSI diskutiert, einer Lobbyorganisation für Verbriefung: https://zinsfehler.com/2013/09/14/das-geschaft-mit-der-verbriefung/. Können sodann die Renditen nicht mehr in der Realwirtschaft erwirtschaftet werden, konzentriert sich das Spiel auf die Finanzwirtschaft. Es ist eine unmittelbare Folge der geldpolitischen Strategie der Zentralbanken und verstärkt die Finanzialisierung an der Nullzinsgrenze: https://zinsfehler.com/2013/10/30/tapering-liquidity-a-trap-yet-a-tapering-in-the-dark-of-economic-theory-2/. Kreditfinanzierte Buybacks sind dann der Höhepunkt der Finanzialisierung und führen zu einer weiteren Fehlallokation von Kapital und einer noch höheren Fallhöhe. Wenn wir nicht in der Lage sein sollten, die Steuern so zu erheben, dass die Staatsverschuldung nicht aus dem Ruder läuft, dann benötigen wir eine zinsfreie ewige Verschuldung über die Bilanz der Zentralbank. Damit ist Zentralbankgeld und Staatsanleihe ein beinahe perfektes Substitut, das exakt 0,00 Prozent Zinsen erwirtschaftet. Nichts anderes hatte McKinsey 2015 mit der Monetisierung der Staatsschulden vorgeschlagen. Besser und demokratischer ist allerdings keine ex post Monetisierung via Anleihenkäufe, sondern die unmittelbare Schaffung von zusätzlicher Kaufkraft über ein niedriges zentralbankfinanziertes Bürgergeld. Dann – und erst dann – wären die Notenbanken wirklich demokratisch verankert und nicht mehr das Beherrschungsinstrument der 1 %. Einen Teil dieses Finanzschaums/fiktiven Kapitals kann man dann wieder via Erbschaftssteuer abschöpfen. Es wäre zugleich der erste vorsichtige Einstieg in ein neues geldpolitisches Instrument, mit dem auch die Zentralbanken am ZLB (Nullzinsgrenze) wieder die Handlungshoheit gewinnen und tatsächlich realwirtschaftliche Impulse initiieren können, ohne die Finanzmärkte unnötig aufzublasen: https://zinsfehler.com/2016/09/25/ein-geldpolitisches-manifest-fuer-europa/ Das Wesen des Kapitalismus ist es, aus Geld mehr Geld zu machen. Dieser Weg sollte aber über den indirekten Weg der Realwirtschaft ablaufen und nicht über die pure Finanzalchemie der Wallstreet. Flash-Crashes gab es, nur wenn interessieren die? Diese finden in einem Zocker Bereich statt und die Beteiligten sollten wissen, was Sie tun. Wenn ich mal was mit Optionsscheinen o.ä. mache, schreibe ich diesen Einsatz auf dem Spieltisch innerlich ab und hoffe auf ein positives Ergebnis. Ebenso Bitcoin, laut Finanzwoche im Hoch vom Pseudowert 800 runter auf 200 Mrd. $, dieser Betrag an „Geld“ ist da doch nie eingezahlt worden. Wirklich schön am Bitcoin: Manche Menschen machen sich mal Gedanken über den „Wert“ des „echten“ Geldes :-). Wirklich schwierig sind die Immos, wenn man sich mal per google Suche „real estate Sydney/Vancouver/Seattle … “ anschaut, für welch oft minderwertige Schrott-Immos da hunderttausende bezahlt werden, graust es einem. Daneben oft gleich ein Finanzierungsangebot mit wenig Kreditrückzahlung. Ich kenne Kleingarten Häuschen in Deutschland, die solider. Ebenso München, 1-2% Rendite sind doch absurd. 2-3% AfA muss man ansetzen und damit setzt man voll auf Wertzuwachs. Der Wert des Grundstücks ist ja völlig offen. Bei mir fast um die Ecke gibt es ein AKW, schöne Immos, hochwertig gebaut – die sind nun ziemlich „wertarm“, weil Käufer mit entsprechendem Einkommen fehlen. Die meisten Eigentümer wollen da eher raus, weil jetzt mit 50/60/70 das Objekt zu groß wird und keine Kinder mehr im Haus sind. Wirklich gruselig scheinen der Bereich BBB-Anleihen, wenn ich von Versicherern höre, dass Sie so im Schnitt 3% Zinsen kassieren macht mir das Angst. Entweder biegen Sie das Ergebnis mit alten Anleihen oder gehen heute absurde Risiken ein. Wenn ich die Credit Spreads diverser Banken anschaue, scheint doch alles in Butter zu sein. ;-) Die sind nach meinem Eindruck niedrig wie lange nicht mehr. „Wenn wir nicht in der Lage sein sollten, die Steuern so zu erheben, dass die Staatsverschuldung nicht aus dem Ruder läuft,…“ –> Wie wäre es mit weniger Staatsverschuldung anstatt mehr Steuern? D ist bereits ein Hochsteuerland und schwimmt aktuell im Steuergeld. „Besser und demokratischer ist allerdings keine ex post Monetisierung via Anleihenkäufe, sondern die unmittelbare Schaffung von zusätzlicher Kaufkraft über ein niedriges zentralbankfinanziertes Bürgergeld.“ –> Wozu? Der Staat müsste den Steuerzahlern einfach weniger Steuern abziehen. Dann hätten sie automatisch mehr Kaufkraft. „Dieser Weg sollte aber über den indirekten Weg der Realwirtschaft ablaufen und nicht über die pure Finanzalchemie der Wallstreet.“ –> Das ist wünschenswert. Die Finanzalchemie spielt den Staaten und damit den aktuellen Machthabern aber kurz- und mittelfristig stark in die eigenen Hände, weil sie diese bei der Finanzierung der Staatsverschuldung „unterstützt“ und der Politik damit mehr Umverteilung ermöglicht. Würde der Weg aus Geld mehr Geld zu machen, nur über die Realwirtschaft laufen, wären die Umverteilungsmöglichkeiten der Politik wesentlich stärker beschnitten und damit auch ihre Macht. Ganz nebenbei würden die Boom & Bust-Zyklen wesentlich milder ausfallen, als mit den Exzessen der Finanzalchemie. Das ist aus isolierter deutscher Perspektive durchaus korrekt, trifft aber keinesfalls auf die Erbschaftssteuer zu. Zudem argumentiere ich insbesondere im Hinblick auf ein zentralbankfinanziertes Bürgergeld nicht aus deutscher Perspektive, sondern aus europäischer bzw. Euroland-Perspektive. Insofern brauchen wir mAn beides: Steuerentlastung insbesondere der unteren und mittleren Einkommen auf nationaler Ebene sowie zusätzlich ein zentralbankfinanziertes Bürgergeld für Euroland. Wo liegt eigentlich – außer ggf. der Dauer der Manipulation – der Unterschied zwischen Ihrem (wohl dauerhaft gewährten) Bürgergeld und dem sog. Helikoptergeld der Zentralbanken? Wo kommen die Mittel für das Bürgergeld für Rest-Euroland her? Was genau wollen Sie mit dem Bürgergeld erreichen? Dieses wird ja unmittelbar zu Preiserhöhungen im Konsumbereich, im Mietwohnungsmarkt, im Immobilienmarkt etc. pp. führen, da ein großer Teil der Bevölkerung plötzlich mehr finanzielle Mittel zur Verfügung hat. Dieser Effekt würde doch den „mehr Einkommen“-Effekt sehr zeitnah wieder zunichte machen. Es wäre sehr schnell alles beim Alten, denn allein der Umstand, dass alle mehr Geld haben, führt ja nicht dazu, dass sie sich mehr leisten können, wenn vieles teurer wird. Sie gleichen dann zwar die unteren und mittleren Einkommen in den Lebensverhältnissen ein Stück weit an die oberen Einkommen an. Das erhöht aber nur den Käufer-Wettbewerb in einem bestimmten Preissegment, tendenziell dem mittleren. Was genau wurde damit also gewonnen? QE4P (= zentralbankfinanziertes Bürgergeld) wirkt unmittelbar ohne den Zins- und Vermögenskanal, da jeder Bürger Zentralbankgeld auf sein Konto gebucht bekommt. Damit erhöht sich M1/M2/M3 unmittelbar und nicht nur die Geldmenge M0, die ja nur in Höhe ihres Bargeldanteils in M1/M2/M3 enthalten ist. Auf der Aktivseite der ZB Bilanz wird nun keine zu revolvierende verzinsliche Staatsanleihe eingebucht, sondern eine ewige Anleihe/ewiges Bürgergeld oder wie auch immer man diese Gegenbuchung nennen möchte. Das wäre nur dann der Fall, wenn wir an der Kapazitätsgrenze angekommen wären und keiner seine Mittel zur Schuldentilgung einsetzen würde. Das mag für Deutschland vielleicht stimmen, keinesfalls aber für Euroland. Insofern wir der Preiseffekt aller Voraussicht nach nicht voll durchschlagen, sondern durch den Mengenausweitungseffekt sowie den Kredittilgungseffekt gedämpft werden. Aber tendenziell führt auch diese Liquiditätszuführung auf einigen Umwegen zu einer höheren Assetinflation. Mit einer Erbschaftssteuer alles kein Problem. Keine Frage! Aber sagen Sie das mal den Sozialisten, die überall regieren. In Berlin demonstrieren schon die Linken (inklusive Antifa versteht sich) gegen die rot-rot-grüne (also linke) Regierung. Genauso in München. Der Wahnsinn kennt keine Grenzen in diesem Land. Unternehmensschulden mögen das Hauptrisiko sein, die Verschuldung der privaten Haushalte ist aber keineswegs risikolos trotz dieser Entwicklung. 29% der US-Haushalte haben weniger als $ 1.000 als Guthaben auf Bank- und Rentenkonten – also praktisch NICHTS auf der hohen Kante. Diese Haushalte sind in der Mehrzahl vermutlich immer noch verschuldet. Wenn die Zinsen anziehen, dürften erhebliche Ausfälle auf die Kreditkartenunternehmen und Banken zukommen. Tja, aber da stellt sich doch die Frage, warum das Eigenkapital so stark gestiegen ist und das nachhaltig ist? Waren es die massiven nicht ausgeschütteten Gewinne der letzten Jahre? In den USA vielleicht, aber in Europa (hüstel)? War es die Reduzierung der Bilanzsumme durch Abbau von Kreditforderungen? Teilweise sicher. Oder waren es vielleicht thessaurierte Scheingewinne durch höherbewertete assets, die von der Notenbank gepusht wurden? Bin leider kein Experte für IFRS. Und leider sagt McKinsey dazu in diesen Auszügen nichts, wenn ich das richtig interpretiert habe. Beispielsweise spricht die Deutsche Bank in ihrem Geschäftsbericht 2017 vom „aufsichtsrechtlichen Eigenkapital“ mit einer harten Kernkapitalquote von 14,8 %. Schaut man in den handelsrechtlichen Jahresabschluss 2017 der AG rein, kommt man auf beim Zusammenzählen von Eigenkapital und „Instrumenten des zusätzlichen aufsichtsrechtlichen Kernkapitals“ auf 5,0 % in Relation zur Bilanzsumme. Das verstehe wer will, Vertrauen schafft das bei mir nicht, denn es ist mir zu komplex. Eigentlich wäre es regulatorisch doch ganz einfach: Die Banken brauchen die gleichen Eigenkapitalregeln, die sie zurecht auch von ihren Kunden fordern. Sind es 25 % echtes Eigenkapital beim Kunden, muss es das auch bei der Bank sein. Dann wird der ganze bürokratische Überbau überflüssig. Aber da traut sich keiner ran, weil keiner seinen Banken reingrätschen will und keine seine Binnenkonjunktur abwürgen will. Aber mit einer klaren Zielvorgabe wie bei der Umstellung der gesetzlichen Rente, das EK jährlich bis zu einer Endquote von X % bis zum Jahr Y umzusetzen, wäre das Thema zu machen. Zur Not halt im nationalen Alleingang.